Indiana Jones. Just the mention of his name, for most of us in the western hemisphere, starts the trumpets playing his theme song in our heads. That name conjures up images of exciting, heroic adventures, too. Adventures where good triumphs over evil; where the uncovering of ancient artifacts, from history and legend, meet twentieth century science and technology. I recall from the third installment, entitled Indiana Jones and the Last Crusade, a plot in which Dr. Jones found himself, again, pitted against the evils of the Nazi regime. You’ll recall, if you’re familiar with this film series, that Hitler’s officers had failed to retrieve for him the Ark-of-the-Covenant in the first motion picture, and now Hitler is after the Holy Grail — the very cup of Christ. Why? He believes Christ’s cup will grant, to whomever drinks from it, eternal life. Indiana Jones (played by Harrison Ford) is fooled into working with the Nazi’s, by a beautiful young scientist named Dr. Elsa Schneider (played by Alison Doody). In the end, it’s Dr. Jones and his father (played by Sean Connery), also a famous archaeologist, who ends up leading the Nazi’s to the chamber where the Holy Grail has been kept hidden almost two-thousand years. Upon entering this chamber they are greeted by a royal guardian (played by Robert Eddison) too old to fight, but clever enough to hide the holy cup amongst many interesting looking vessels. He looks to his young visitors and bids them choose wisely, for to do so will mean life or death. As the climax of this plot unfolds, we see one of the Nazi representatives (played by Julian Glover) selecting foolishly and drinking from one of the many chalices of death, represented in the chamber. Then Indie gets his turn. Dr. Jones, carefully ponders the things of Christ and chooses wisely. Indiana ultimately enables himself, and his father, to drink from the cup of eternal life. A great metaphor for what you and I, and really all of humanity, are called to do every day we live. Choose to live according to the truth that brings eternal life, or dare to choose to live according to the many lies that lead to death. 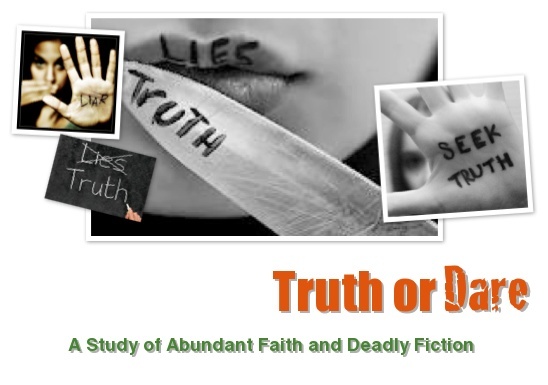 In this study, called Truth or Dare, we will be examining the various chalices that mankind may choose to drink from while searching out eternal life. Most of these chalices will be full of deadly lies, but one — yes, only one — will hold the life giving truths that will lead us to abundant, eternal living. This brings to mind the childhood game, also known as, Truth or Dare. For those of you unfamiliar with this game, I’ll take a moment to explain it to you. Children would gather and select an arbitrator. Once selected, the appointed leader would challenge each child to either tell a secret truth about themselves or act out a dare dictated to them by the arbitrator of the game. I was always amazed at how scared kids would be to tell a truth about themselves, myself included, but equally amazed at how quickly they would choose the dare, only to regret it later once they learned how diabolical the dare was. Occasionally the arbitrator was kind and dealt out easy dares to accomplish, but many more times the dares were border line criminal and down right immoral. Such too is life. Humanity is presented with this very same dilemma, on a daily basis. The dilemma? To choose to believe, and speak, the truth of Christ to the rest of humanity or choose to know of the truth, and hide it. The problem with that is, if we don’t choose to confess the truth of Christ before mankind then Christ won’t confess He knows us, on Judgement Day, before God the Father (Matthew 10:32). True faith in Christ equals our obedience to His commands. The third option that humanity can embrace is to partake in the dares that Satan dictates to them, then eternal death becomes mankind’s destiny. That choice dulls our spiritual senses, forcing us to look death in the face and act as if nothing is wrong; as if all is right and normal. Those that make this choice act on the lie that truth is relevant to their own wants and desires. They accept Satan’s lie that says absolute truth is really the biggest falsehood of the ages. The one really big problem with that — you can’t make the truth go away, and escape it’s consequences, by simply choosing to not believe in it. You see, just like the Nazi from The Last Crusade believed he chose correctly, so too do many of us choose daring lifestyles, philosophies, and theologies. 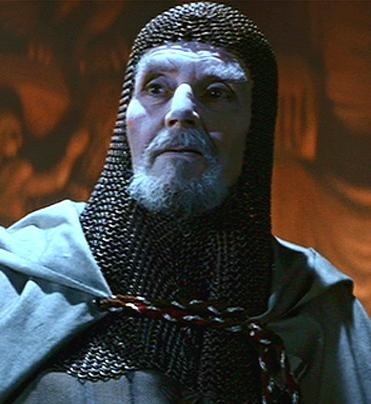 We whole heartedly believe that we have chosen correctly, only finding out after the fact that we have chosen “poorly,” as the knight from the movie stated, and then death takes us away. It’s imperative that we take the time to study what really is the truth. We must do as Indiana Jones did, and ponder the truth of Christ, and make the wise choice. The choice that will lead us to living an abundant and eternal life. 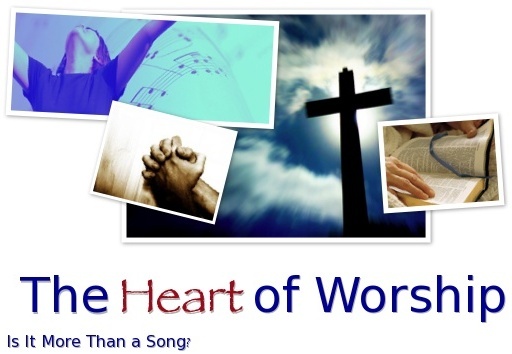 The type of life we, as God’s creation, were meant to enjoy; the life of a true worshiper. So I ask you to join me in examining the various chalices of our lives. Such vessels as life styles, religion, philosophy, and science (to name a few). Looking them over, one-by-one, and allowing the truth that is the real cup of Christ to illuminate our minds, bodies, and souls. In the end, I trust you will have chosen to drink from the grail that leads to eternal life — the true, holy cup of Jesus Christ. 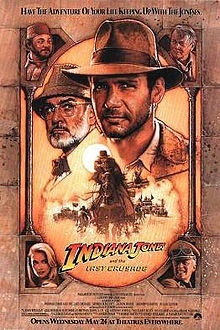 Indiana Jones and the Last Crusade TM © 1989, 2008 LUCASFILM LTD. All rights reserved. Have you ever heard or sung a song and wondered about how it came to be? What burned inside the songwriter’s soul so intensely that it just had to be written down on paper? I know I have — often, too. Maybe it’s just my curious nature, mixed with my own musical bent, that causes me to think along these lines. Then again, music does move, manipulate, and touch people; no matter our background, education, status in society, or talents. 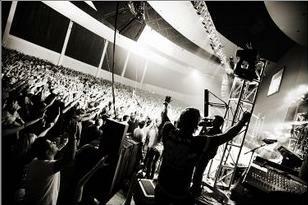 Especially the music that represents our faith; music that calls us to worship the one true, living God. 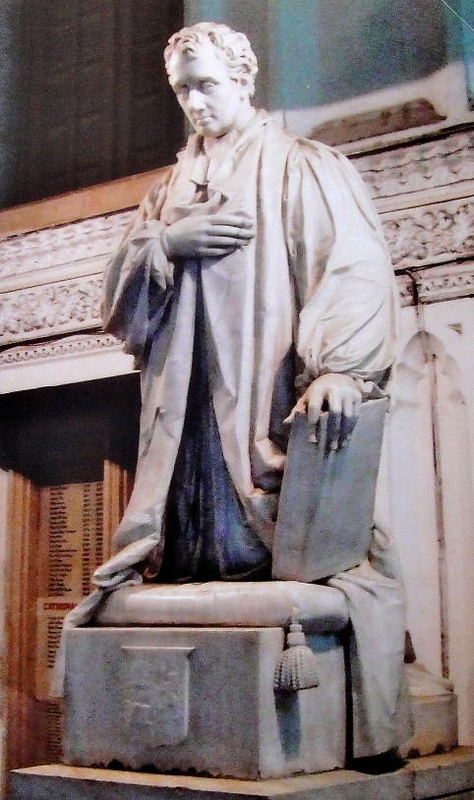 Recently, I looked into the life of hymnodist Reginald Heber (1783-1826), who was the second Bishop to represent the Church of England in Calcutta (a.k.a. Kolkata). Reginald was born the son of an Anglican rector, and it has been said that he was an incredibly gifted child. Some accounts of Reginald’s childhood even state that, by the age of 5, he had read the entire Bible and comprehended its meaning. Consider that for a moment. Later in life, while attending Brasenose College, Mr. Heber proved to be a scholar of theology, Latin, Greek, and an exceptional poet. 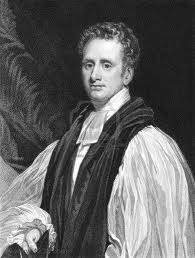 In 1807, Reginald was ordained and began his quest to improve the congregational singing taking place in the Church of England. 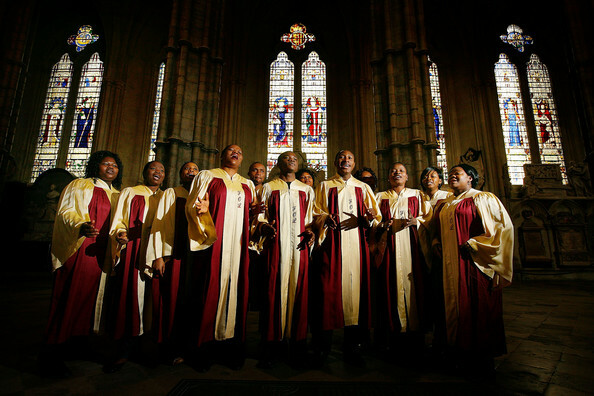 His dream was to write and collect a group of hymns that would follow the liturgical calendar, thus moving the Anglican’s away from simply singing the Psalms. 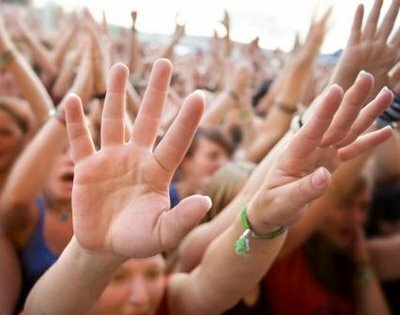 Of the known 14 hymns still in circulation today, none have crossed denominational lines like the timeless hymn Holy, Holy, Holy, Lord God Almighty. Written in India, in the year of Bishop Heber’s death at age 43, Holy, Holy, Holy, Lord God Almighty was heralded by Alfred Lord Tennyson as the finest hymn ever written. What moved Reginald to write it? No one knows the whole story behind this hymn, but its obvious reference to Scriptures found in both Isaiah 6:3 and Revelation 4:8 are certainly the hymn’s foundation. In these verses of Scripture, as in the Bishop’s hymn, we read of a call to worship that is so overwhelming that the two author’s, Isaiah and John, can’t help but absorb the moment — like a dry, brittle, thin sponge that can’t get enough water and, once it does, just continues to expand and expand until it can hold no more and overflowing begins. Holy, holy, holy, is the LORD (Adonai) God, almighty (El Shaddai)! Let’s look at the word “holy” a bit more deeply to understand why the Creator, Elohim, is called by this title. (adjective) dedicated or consecrated to God or a religious purpose; divine, sacred: the Holy Bible. • (of a person) devoted to the service of God: saints and holy men. • morally and spiritually excellent. I want to point out the last statement in the above definition, “morally and spiritually excellent.” In other words, morally and spiritually perfect! 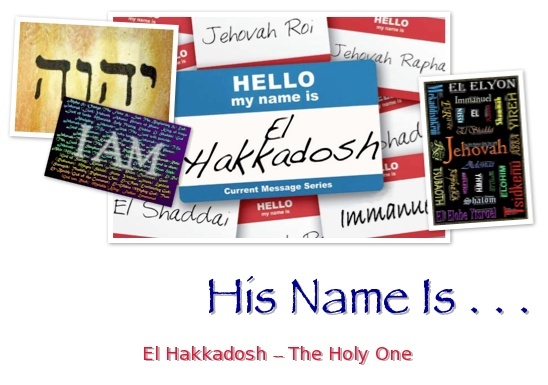 When God is called “holy,” or “kaddosh” in the original Hebrew, He is being called perfect, flawless, pure. God is without blemish, without anything that is considered wrong, both morally and spiritually. You and I can’t even begin to fathom the depth of what this word “holy” means because we are a fallen race, so far from perfection. Yes, it is true that through the sacrificial death of Jesus Christ we, as believers, are made holy (a.k.a. 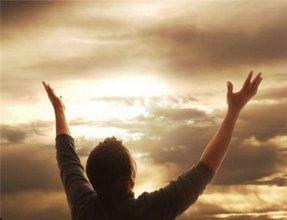 set apart, consecrated, sacred, purified, etc. ), but to truly know holiness as God is holy — until we are truly in the presence of Elohim we will always fall short of just what “holy” is. I’m amazed every time I read an article, blog, or book, or hear a song, or some statement where people pass judgment on God because of something they misread, or misunderstood in the Bible, or because of some tragedy that occurred in their life, or in history. As if somehow humanity affords enough holiness or self-righteousness to do so. It’s ridiculous enough that there are people in this world who believe they can somehow attain enough holiness, enough perfection, on their own merit to somehow achieve a place in heaven with God or even achieve godlike status, themselves, in the here after. But seriously, people — judgement of God!? Really!? What is it that makes humanity think we have the authority to judge the Creator of all things physical and spiritual? That is one of the greatest lies Lucifer ever passed off on mankind. Such foolishness! Holy, holy, holy, LORD God, almighty! Early in the morning our song shall rise to Thee. Holy, holy, holy, merciful and mighty; God in three persons, blessed Trinity! Holy, holy, holy! All the saints adore Thee; casting down their golden crowns around the glassy sea. Cherubim and Seraphim, falling down before Thee, which were, and art, and evermore shalt be. In these first two verses we see Bishop Heber painting a word picture, direct from Scripture, that depicts what should happen daily when physical creation acknowledges the holiness of its Creator. 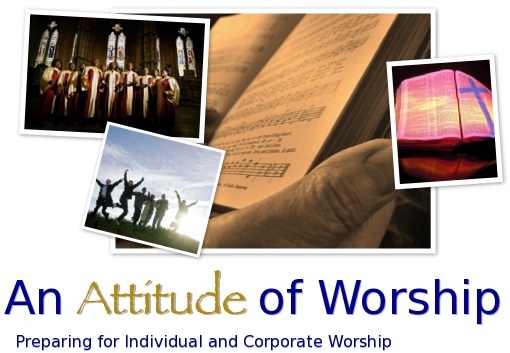 Depicting, plainly, what does happen and what will always happen when spiritual creation enters into the presence of the Masters, three-in-one — true worship! Holy, holy, holy! Though the darkness hide Thee, though the eye of sinfulness Thy glory may not see. Only Thou art holy; there is none beside Thee, perfect in power, in love, and purity. Holy, holy, holy, LORD God, almighty! All Thy works shall praise Thy name in earth and sky and sea. Here in these final two verses we see truth laid out in “plain English.” God, in His triune perfection, cannot be seen by us, in our imperfection. Our sin nature blinds us, prevents us from seeing and knowing El Hakkadosh — the Holy God! Why? Because sin separated us from God. Not because God pushed us away, but because the natural cause and affect of perfection and imperfection is that they cannot coexist. It’s just like light cannot coexist with darkness. The moment light hits darkness, the darkness flees. You see? The moment God’s holiness hits sin, the sin must flee. Imperfection can’t remain in the presence of perfection without consequence of death (Romans 5:12-21; 6:1-23). Were it not for God’s merciful sacrifice of His only begotten Son, Jesus Christ, we would never have the hope of returning to Him as the true worshipers He created us to be. Only the covering of Christ’s holy blood can remove the imperfection from our souls and allow us to return to the presence of El Hakkadosh. So stop ignoring the fault inside yourself, and begin the process of allowing God to deal with that fault. Cease trying to foolishly “shop around” for a version of God that fits what you think a god should be. God (Elohim) is LORD (Adonai), because He IS — despite what humanity wants to think. Modern day Judaism isn’t the answer, and neither is the destructive teachings of Islam! The Mormon’s and the Jehovah’s Witnesses teachings of Christ and the triune God are nothing more than perversions of the truth! Also, don’t allow yourself to remain in the lie that you can somehow achieve perfection on your own. Sitting on a mountain top, all of your life, meditating does nothing for you except remove you from reality. It’s time western culture and the rest of the world woke up to the false philosophies of Buddhism and Hinduism! Lastly, evolution and atheism are probably the most ridiculous lie of all the lies spoken to humanity by Satan. The Creator, IS God, and always will be God whether you choose to believe in Him or not! What humanity thinks is not of importance, what God says IS — period! After all, when considering all the wonderful things God has created, what significance does mankind really hold? None, when separated from God. Humanity’s significance, our glory and honor, comes only from achieving God’s original purpose; that purpose is to be true worshipers of the Holy God (El Hakkadosh). When we are able to see God as holy and ourselves as unholy, apart from Him, then we can begin to realize our significance and cease being foolish in believing we can pass judgment on God or “shop around” for a god of our own liking. Ponder these verses. Reflect upon what is being said here, and begin to allow yourself to experience God as He really is — El Hakkadosh — The Holy One. 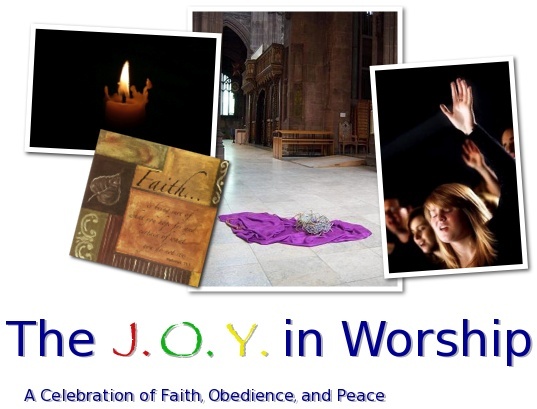 Holy, Holy, Holy, Lord God Almighty lyrics by Bishop Reginald Heber and music written by John B. Dykes. Public Domain. Copyright contingent upon arrangement and publishing company rights.